An activity tracker, also known as a fitness tracker, or a smart wristband, is a device used for monitoring and tracking fitness-related metrics such as distance ran or walked, calorie consumption, and in some cases heart rate and quality of sleep. Fitness trackers are in high demand, especially with many people trying to stick to their New Year’s Resolutions. Slowly but surely, they are becoming the norm and, under the radar, are changing people’s lives. What can a fitness tracker do? One of the core purposes of a fitness tracker is to monitor steps taken by the user. This, in the case of the SWB100, is calculated using the combination of a complex algorithm, the inbuilt accelerometer and information about the user including height. Using this, the device is able to accurately count the steps taken by the user. Using the data from the steps taken and the user’s inputted information, the wristband can calculate an estimated amount of calories lost during use. Adding to this, the device can gage the distance walked based on multiple factors combined with complex algorithms. Fitness trackers commonly have built-in vibration components, a unique feature which has the ability to wake you up by vibrating during your sleep. The user can select the ring alarm in the settings to activate the vibration wake-up function, or set a reminder for important events. This way of awakening or reminding is much healthier than a traditional alarm clock. Studies show that being awakened by an alarm clock can cause people to feel flustered, waking them up in a depressed mood and can even affect people’s memory, cognition and calculation speed. Adding to this is the reminder function, which can be used to understand the progress towards the current goal. This gives information on how many steps have gone, such as how far from the day’s goal you are and so on. Most fitness trackers provide the reminders through their screen, rather than needing to open the application to receive the information. For some, this may be the best solution and easiest way to see their reminders. As well as tracking everyday activities, activity trackers can record an accurate amount of steps taken during sport. 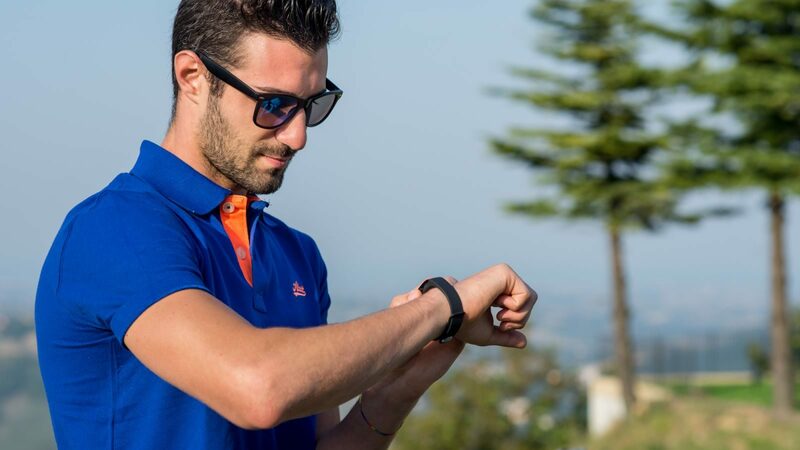 Users can view the fitness trackers synchronization data through the mobile application, which includes information such as exercise time, sedentary time, exercise distance, steps taken and so on. Setting goals can encourage and motivate people to achieve them, such as setting targets for the amount of steps taken. Goals are tailored to the user, as a marathon runner and an office worker, for example, are unlikely to have similar goals. However, for an office worker, activity trackers can be used to remind them to do some stretches, exercise muscles, walk about or anything to increase blood flow. Start your fitness tracker journey! If you want to give fitness tracking a try (but without a wearable), start by using a mobile app that counts your steps. This method requires the least commitment, and could be of interest if you’re a beginner. You can have a very enjoyable time using a fitness tracker with the applications available for it! All your movements and data will be stored on the app and it can create your own private fitness schedules. Don’t forget the heart rate and sleep monitoring functions! The ability to see your heartrate can be a great indicator for your health, and seeing your sleep patterns, including the length of your deep and light sleeps can give you an understanding of how your body acts through the night. The August SWB100 is an example of a well-rounded activity tracker, which includes all the functions and features mentioned throughout this post.